This map illustrates satellite-detected possible flood water & saturated soil over Sennar State, extracted from Radarsar-2 imagery acquired 12 August 2016. UNOSAT has analysed the area using a Radarsat-2 image acquired on 12 August 2016 to identify and delineate the Possible Flood Water & Saturated / Wet Soil. According to satellite derived analysis some areas within Sennar State seem to be flooded. 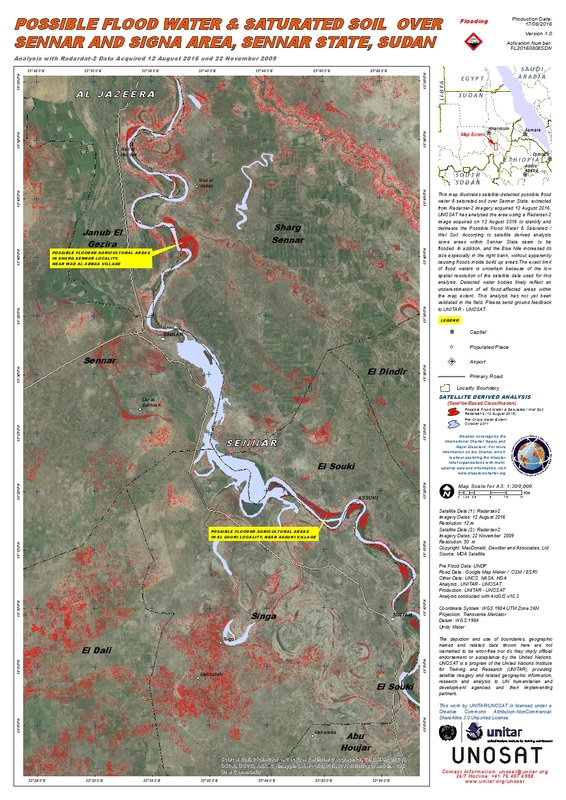 In addition, and the Blue Nile increased its size especially in the right bank, without apparently causing floods inside build up areas.The exact limit of flood waters is uncertain because of the low spatial resolution of the satellite data used for this analysis. Detected water bodies likely reflect an underestimation of all flood-affected areas within the map extent. This analysis has not yet been validated in the field. Please send ground feedback to UNITAR - UNOSAT.